I've been looking for a large fluff brush for a while now, something similar to the MAC 227. Because I find it really perfect for setting powder on my under eye area. I was searching online shops for a MAC 227 brush dupe, but the closest one I found was the Sigma E50 Large Fluff brush. I still find that a little pricey so I looked into charm brushes, and what do you know I found a large blending brush. I know this isn't a dupe but it does the job. Charm Essentials Classic Blending Brush is your multi-tasking blending brush - it blends your eyeshadows into a seamless gradient so that you need not sport harsh edges on your eyes! Aside from that, it is also a useful brush to dust loose powder around the eye area, and apply a wash of eyeshadow on your lids. I find this brush to be really versatile and multifunctional. 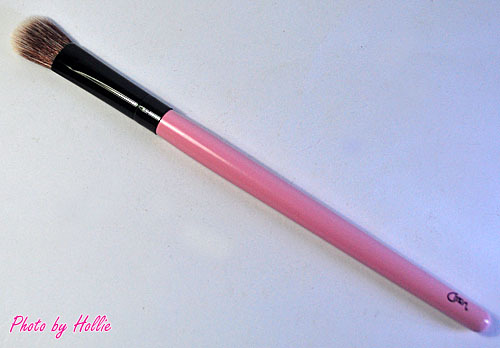 I don't really use this to blend my eye shadows, but it makes a great blending brush for any powder product. I prefer to use this mainly for setting powder on the under eye area and removing eye shadow fall outs. I also use this for highlighting and contouring the nose as well as highlighting the brow bone area. By the way, for those living in Cebu, Charm brushes are available at the Dolled Up Make Up Studio & Supply. I bought this brush there. Feel free to check the Beauty & Minerals page on facebook for more info about their Charm Brushes. Looks like a very versatile brush! Great review :) New follower here!